Not that Situation Vacant is dreadful – Early Morning Murder is, mind you – but it hardly rates next to the finest from Miles Burton aka John Rhode. The first chapter, a portrait of the unpleasant Mr Green starts the book off very well. The scene where he goes to the local chemist to get a solution for his daughter’s behaviour is creepy as hell, but it goes downhill from there. Admittedly, I’ve had to read this in small chunks, rather than in a single sitting, but it still seemed to drag on forever. Murder M.D. 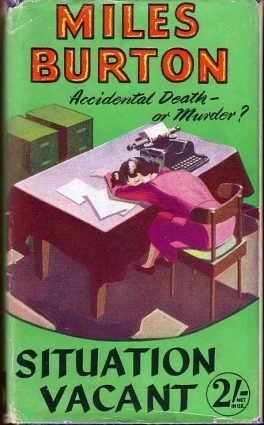 has a similar idea, if you replace repeated doctor murders with repeated secretary murders, but while that book was a load of fun and never seemed to drag, even before Merrion turns up, this one was the opposite. That’s supposed to be an evil face smiley! This book was recently reprinted by ramble house too. Shame it isn’t a good one. Yes, this is mediocre! You could, though, say it *is* representative of the man’s work – it’s an ultra-typical, undistinguished Burton, written on autopilot (“fishberries” aside). There’s a village; members of the same profession are exterminated; and Merrion and Arnold argue their way through the case. Arnold, of course, leaps to a solution that is both obvious and idiotic. That describes half the Burtons! Street churned out four books a year. You could guarantee that at least one would be good, and the others anywhere from boring to good. Rarely gobsmackingly brilliant, though. I haven’t read this for a while, but I’d say it is better than mediocre, while not his best work (that would probably be The Three Corpse Trick, out of those that I’ve read – admittedly not a high proportion). The question of why some books by prolific authors are far easier to come by than others is quite a puzzle – one possible answer is that the better ones are less likely to be discarded and so available for resale!